Kangaroo Island is a wildlife haven and the perfect showcase of Australian natural coastal beauty. An easy trip from nearby Adelaide and the mainland, either by ferry or by air from Adelaide Airport, we will have you on these idyllic shores in no time. The coastline here has been sculpted over the years to form some geological wonders – Admiral’s Arch for instance, and whilst the beaches are freckled with sea lions, you’re also sure to discover fur seals, kangaroos, koalas, echidnas and wallabies too. With over 1,200 miles of the Great Barrier Reef along the Queensland coast, there are a whole host of options for a perfect island stay. Our top three are Lizard, Heron and Hamilton; each entirely unique and with different experiences on offer. At the very north of the reef, you’ll find Lizard Island, the go-to spot if you’re looking for romance, with 24 private beaches and the world-famous cod hole for diving. Then nestled in the Whitsundays you will find Hamilton Island, which is the perfect place to take a seaplane over Whitehaven beach and Heart Reef, when you’re not out and about sailing the waters. Further south again, you get to Heron Island – a nature lover’s paradise. You’ll find all manner of birds throughout the year, as well as being able to get up close and personal with turtles, or spotting humpbacks pass the waters during migration in June. Just a two hour flight from Sydney or Brisbane is Lord Howe Island. It may sound cliché to call this paradise, but for want of a better word, it truly is – especially as only few hundred people can visit it at one time to protect its World Heritage listing. Step back to an era of trust where people don’t lock their doors and enjoy Aussie friendliness, while taking in the island’s natural beauty. Formed of coral reefs, towering mountains and tropical forests there is certainly a mystique about Lord Howe Island. The island is a biologist or geologist’s dream where you can feel like you’re discovering the next Galapagos while snorkelling among colorful fish or spotting birds flying overhead – but you can also just relax on the hidden beaches or indulge in spa treatments. 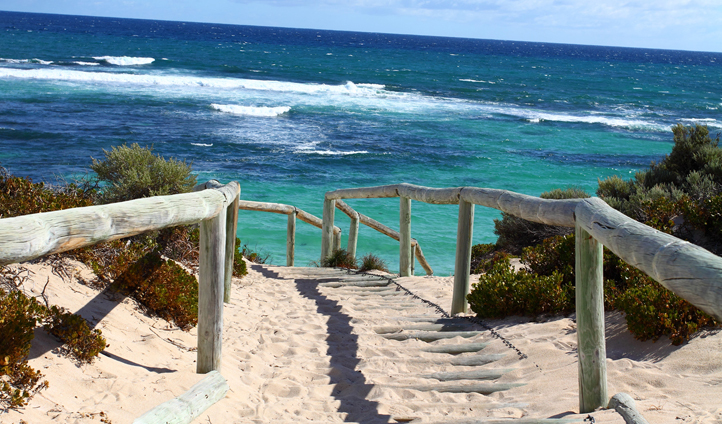 A short trip away from Perth lies Rottnest Island, a jewel off the coastline of Western Australia. The island is accessible by boat or by a 12 minute heli flight and is home to yet more fabulous antipodean wildlife, along with some historical importance too. Sandy beaches lead to salt lakes and the island is surrounded by coral reefs. There are plenty of activities to keep you busy, from surfing and fishing to hiking. However one simply must not miss the opportunity to see Rottnest Island’s most famous inhabitant – the quokka. Take one of the many walking tours into the marsupials’ natural habitat and try to get a famous selfie with the seemingly smiling animal.